I have a bit of a confession... I am an addict. And sadly I cannot stop myself, help myself, or want to either. I am addicted to Pinterest!! Pinterest, that magical land where you can find anything about everything!! And, in most cases with complete how-tos!! Which brings me to today's project. 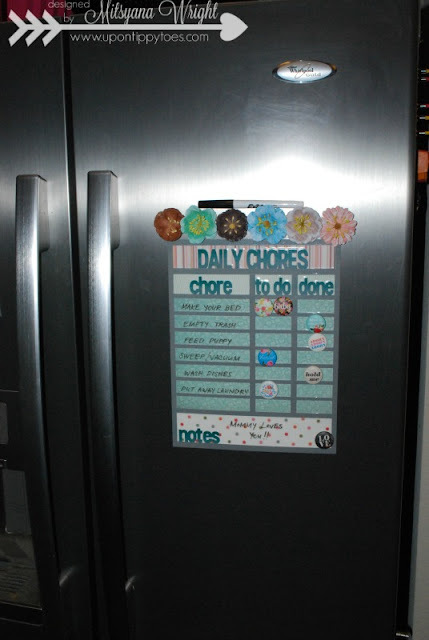 I've seen several posts on how to make chore charts for your children. I didn't want anything that was bulky or took up a lot of space. So I decided at having a hand at creating an SVG file that can simply be downloaded and cut with my electronic die-cutting machine. I will be linking the file in this post!! 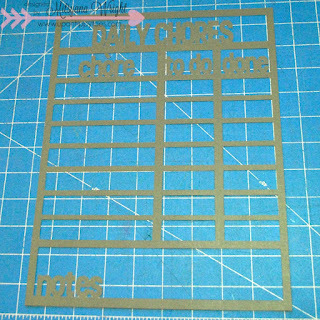 After uploading the chore chart file into my software, I loaded my mat with a full 12" x 12" sheet of paper. 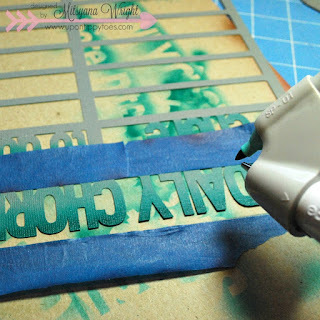 This color will be for my grid lines. I cut the file at 9 "x 11.5". I think it came out pretty darn awesome. I wanted to make it simple because my children are all pretty young still. And a huge overly detailed one might be confusing to them. 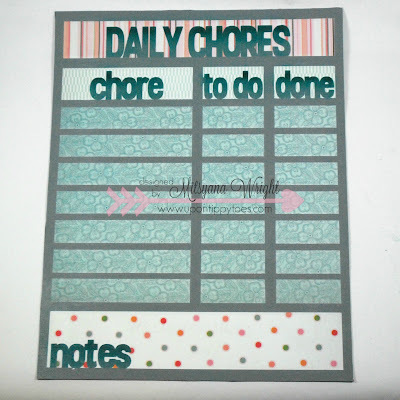 I was able to divide the chart and include a "to do" and "done" section... so all your child has to do is move their marker. I also added a little "note" area. This if great for reminders or shopping list. You can find that version of the chart file HERE. 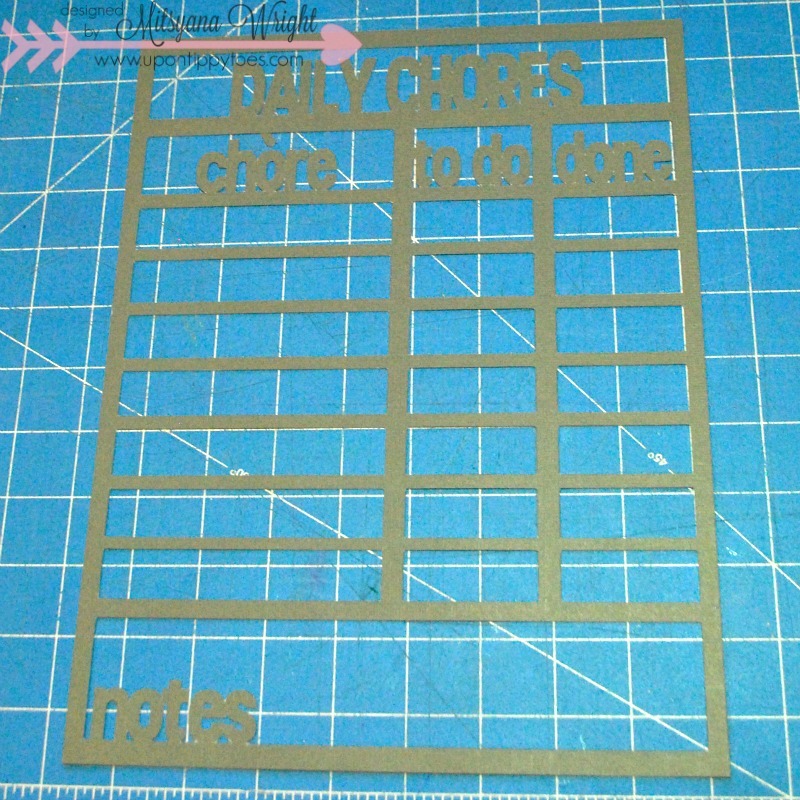 And for those of you who would like the option of customizing your own, I also have a blank chart as well. You can find that file HERE. This part is totally optional! But you know me... I have to eBrush EVERYTHING!!! I think it adds so much depth and really makes the words POP! I first taped off the word with blue painters tape and airbrushed the words using a teal and a turquoise sharpies. Once I was done ebrushing I flipped it over and applied 2 way glue onto the entire backside. 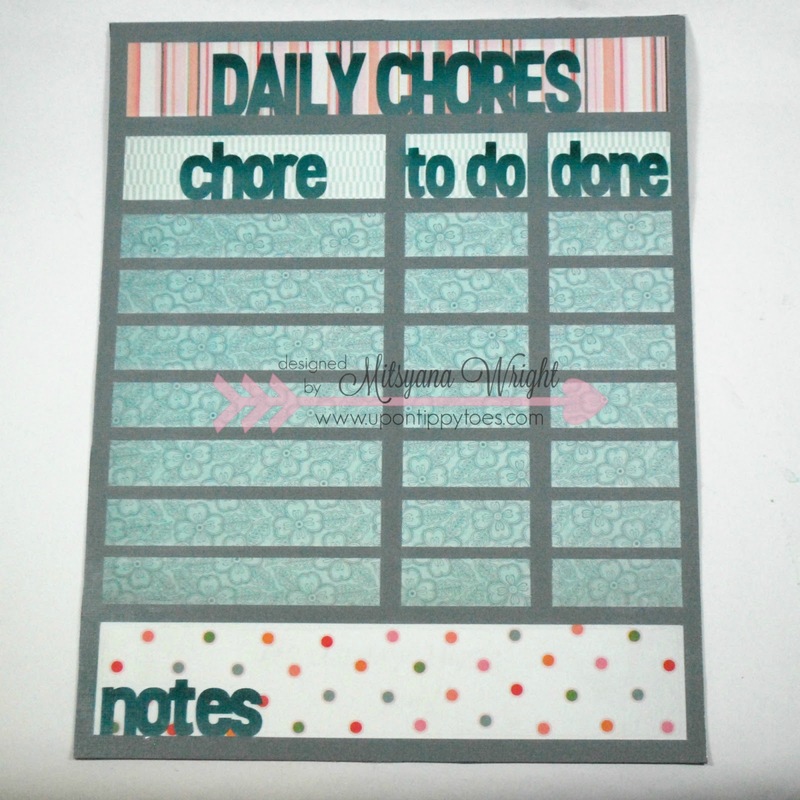 I applied different patterned papers from Basic Grey's Dear Heart Collection as panel pieces. I think these paper are gorgeous and just perfect add as my chart backer. If a solid panel look is not for you, and you would like the option of adding different panels to the back of your chart I also have a panel file for you! I sized these panels to slightly overlap each other so be aware that they are slightly bigger than their designated spaces. 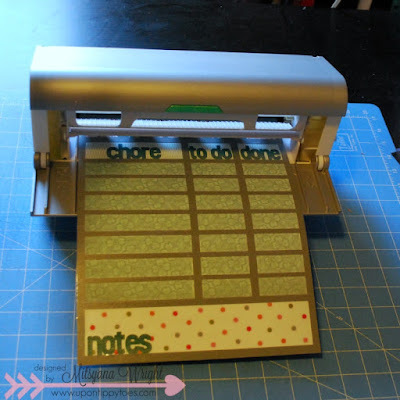 After combing the background papers to my liking I gave my entire chart a run through my Xyron Creative Station with the Magnet Laminate cartridge loaded. And here is my finished chart! Now I can slap it up on my fridge because I just made a Magnetic Chore Chart!! 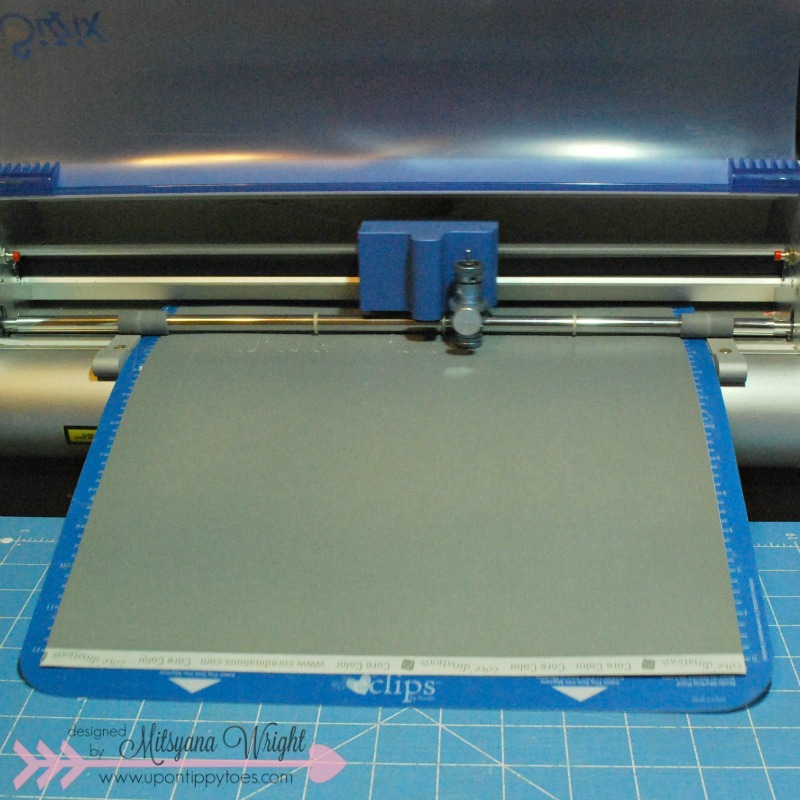 And because the Xyron Magnet cartridge also laminates... guess, what??!! It is also now a dry erase board!! I used some fridge magnets I had previous made as chart markers. I simply hot glue disc magnets to the backs of buttons. And for a little added decoration I added more discs to the back of paper flowers too... OMG, how stinkin' cute is that?? I hope you enjoyed this project!! My children loved it!! And they are the weirdest children EVER!! 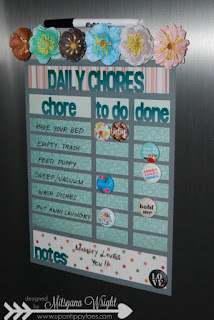 the very next day, after seeing the chart on the fridge and reading it, my daughter scurried to see what chore they could do on the list so they could move their markers... Weird, right??!! I mean what child actually wants to do housework and chores?? LOL Apparently, mine!! I'm gonna just let that ride because I don't want to break the spell!! Adorable chart!! I love it! !